Brain Imaging Technology is on a mission to provide Brain Imaging Technology information starting today . . . Computed Tomography Scan - (CT Scan) CT scans use a series of X-ray beams passed through the head. The images are then developed on sensitive film. This method creates cross-sectional images of the brain and shows the structure of the brain, but not its function. Positron Emission Tomography (PET) A scanner detects radioactive material that is injected or inhaled to produce an image of the brain. Commonly used radioactively-labeled material includes oxygen, fluorine, carbon and nitrogen. When this material gets into the bloodstream, it goes to areas of the brain that use it. So, oxygen and glucose accumulate in brain areas that are metabolically active. When the radioactive material breaks down, it gives off a neutron and a positron. When a positron hits an electron, both are destroyed and two gamma rays are released. 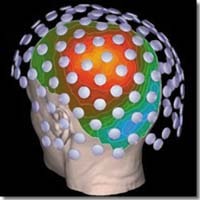 Gamma ray detectors record the brain area where the gamma rays are emitted. This method provides a functional view of the brain. Disadvantages: Expensive to use. Radioactive material used. Magnetic Resonance Imaging - MRI uses the detection of radio frequency signals produced by displaced radio waves in a magnetic field. It provides an anatomical view of the brain. Advantages: No X-rays or radioactive material is used. Provides detailed view of the brain in different dimensions. Safe, painless, non-invasive. No special preparation (except the removal of all metal objects) is required from the patient. Patients can eat or drink anything before the procedure. Disadvantages: Expensive to use. Cannot be used in patients with metallic devices, like pacemakers. Cannot be used with uncooperative patients because the patient must lie still. Cannot be used with patients who are claustrophobic (afraid of small places). However, new MRI systems with a more open design are now available. Functional Magnetic Resonance Imaging (fMRI) detects changes in blood flow to particular areas of the brain. It provides both an anatomical and a functional view of the brain. Angiography involves a series of X-rays after dye is injected into the blood. This method provides an image of the blood vessels of the brain. Powerful brain imaging technology is allowing researchers to actually tell what a person is thinking before they even say it. A study, published in the November issue of the international Journal of Cognitive Neuroscience, has shown that it is possible for researchers to look at brain imaging data and determine whether a person is imagining a face or a place. "With the technology available to us today, we are now able to identify the content of a person's thought, albeit in a very limited context," says Dr. Kathleen O'Craven, a cognitive neuroscientist who led the study at Massachusetts General Hospital. Dr. O'Craven is now with Toronto's Rotman Research Institute at Baycrest Centre for Geriatric Care. In the study, six women and two men, aged 20 to 39, were put through two cognitive exercises: one involved looking at pictures of faces, and a second involved looking at pictures of places or landscapes. Later these same adults were asked to mentally 'imagine' the faces and the places they had earlier seen. During both tests, functional magnetic resonance imaging (fMRI) scans were taken of their brains. Many previous studies have shown that brain areas can be selective for processing a particular type of visual information. In the cortical brain regions associated with mental processing, the 'fusiform' face area responds strongly to faces while the 'para hippocampal' place area responds strongly to indoor and outdoor scenes depicting the layout of local space. In this study, Dr. O'Craven and colleague Dr. Nancy Kanwisher of the Massachusetts Institute of Technology found the strongest evidence yet that this specialization holds true even when participants were given no visual stimulus and were simply asked to 'imagine' a face or a place. They also found that the magnitude of activity in these two brain areas is much livelier or stronger when one is seeing the picture (physically present in front of them) compared with just imagining it. The most fascinating finding, however, is when 'data coders' (researchers who interpret data) were asked to look at fMRI scans and guess whether the study participant was thinking of a face or place. They were able to accurately report what the participant was thinking about on 85 percent of the trials! Click-here for Health Tip-of-the-Day. "What we've shown is that we can actually tell, on a moment-by-moment basis, what an individual is thinking about, by measuring brain activity rather than having the person tell us," says Dr. O'Craven. "Of course, this can be done only in a limited context -- we've been able to demonstrate it for differentiating between faces and places -- but the implications are far-reaching." She says the technique could be used to gain some insight into what is happening in the minds of people who are unable to communicate because they are suffering from an injury or disorder that makes speech impossible. "We may someday be able to get a glimpse of what a patient is able to comprehend, even when that person can't answer questions directly. We could show them pictures of faces and places and, using fMRI technology, see whether their visual system is processing them. In addition, if these brain areas respond differentially to the 'spoken' names of people and places, we may be able to infer that they understand." The study was supported by The Bunting Institute at Radcliffe College and by grants from the National Institute of Mental Health, the Human Frontiers Science Program, and the Dana Foundation. This story has been adapted from a news release issued by Baycrest Center For Geriatric Care. BRAIN-SCANNING TECHNOLOGIES NEED STANDARDS, ACCORDING TO STANFORD RESEARCHER STANFORD - Researchers have developed ever more sensitive ways of peering into the brain to seek out explanations for brain disease. In most cases these technologies are good news for patients, bringing new ways of understanding health and treatment options. However, standards defining ethical ways of moving forward with the new technology are needed in order to prevent abuse. Judy Illes, PhD, senior research scholar at the Center for Biomedical Ethics at the Stanford University School of Medicine, will discuss the clinical implications of new imaging technologies Feb. 18 during the "Neuroethics: Neuroscience and its ethical, legal and social implications" panel discussion at the annual meeting for the American Association for the Advancement of Science in Washington, D.C.
Illes will also discuss her ongoing work examining how research studies handle those healthy subjects whose brains show sign of abnormalities, called incidental findings. These features could be harmless such as a benign cyst but could also be life-threatening malignant tumors or abnormalities in the blood vessels. Each type of brain-imaging study poses its own quandaries. For example, should all brain studies have MDs on the research team? The volume and cost of having a physician read each and every scan would be staggering. "When a subject goes into the study, does he or she know it might not be a medical professional who looks at the brain images?" Illes said. Another issue that research subjects may not realize is that if a benign tumor is found during a scan and listed on their medical records, it could alter health insurance rates. Illes recently cochaired a meeting at the National Institutes of Health intended to establish standards for how research groups handle these types of incidental findings. An important way in which imaging is now reaching patients is through direct-to-consumer whole-body scans, which are advertised as a way for patients to feel confident of their health. But these advertisements paint a rosy picture of what the scans can detect without hinting at the technology's limitations and risks.